Summer is a busy time for many of us. Summer is the time when families are hitting the road, travelling to a new or familiar place to relax and have some fun in the sun! Other animals are on the move too! Like snakes! For the most part, snakes are making their way across the forest floor and through fields. But some snakes are taking a vertical trip! Up a tree that is! Gray Ratsnakes are one of the few snakes that can climb trees! They have special characteristics that help them to be excellent tree climbers! First is the fact that they have strong muscles. Gray ratsnakes are constrictors so they kill their prey items like small rodents by squeezing them until they cannot take a breath. They then will swallow their now lifeless prey whole. So they have very strong muscles to hunt which helps them to be great tree climbers. They flex and relax their muscles between the grooves of the bark along the trunks of trees to climb vertically! Another characteristic that Gray Ratsnakes have is their flat stomachs. Their flat stomachs give them more surface area for them to cling to trees. Murphys Point Provincial Park is fortunate enough to have two new juvenile Gray Ratsnakes that are now call the park Visitor Centre home. One of the juveniles is named Gamma who loves to explore and climb! Gamma is very fond of climbing the sides of the tank! Whether it’s a tree or the ledge in a tank, these Gray Ratsnakes can really climb! 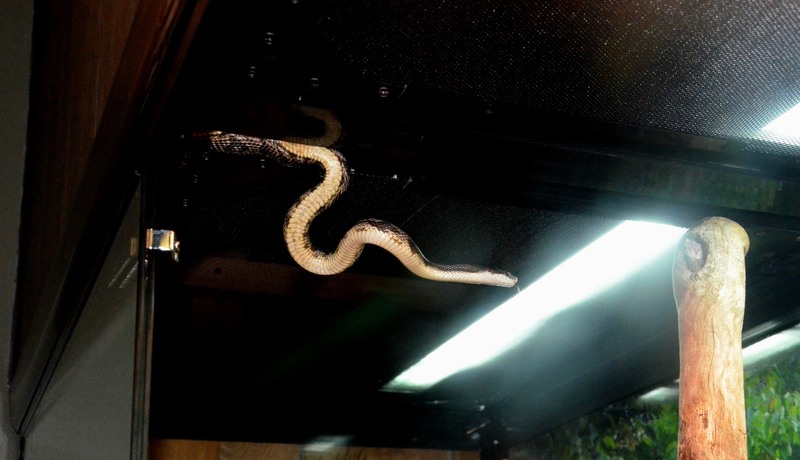 Looking up at the roof of the tank, Gamma is demonstrating how Gray Ratsnakes have excellent tree climbing skills by skillfully climbing upside down between two panels of the tank.